On September 25 2014 the PureTrails team and a group of friends and family cycled the Otago Rail Trail in one day (all 152km of it!) in support of our mate and former PureTrails tour leader, Jim Millar, who sadly passed away from Motor Neurone Disease in July 2014. Before Jim died the PureTrails team, driven by the sadness and frustration at not being able to do much to support Jim during his illness, decided to take on an immensely physical and mental challenge. We felt this would be a fitting quest as Jim loved a challenge and an excuse for another adventure, with plenty of camaraderie, stories, and a few well earned drinks at the end of it all. After joining the PureTrails team in 2006, Jim quickly became a great friend and valuable member of the PureTrails team and over the years we were lucky to have shared many adventures with Jim. 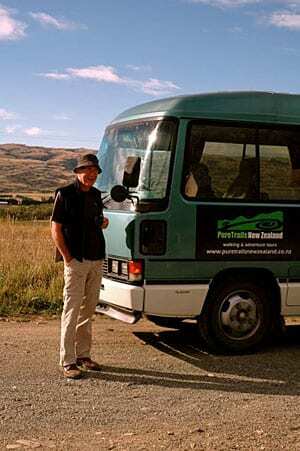 By April 2013, Jim had guided over 700 people on 73 PureTrails trips. Jim’s gentle caring nature, sense of humour, and amusing stories about the characters of the communities we travel through made him a popular guide. Above all Jim had an immense love of the South Island particularly his home stomping ground of South Canterbury, which was evident to all who knew him. In doing our ‘Ride for Jim’ together we raised almost $20,000 for the MND Association of NZ, which was then donated to the Centre for Brain Research at the University of Auckland where MND research is underway. We live in hope that one day there will be a cure for this terrible disease that took our mate Jim. You can view the images of our special day here.